The book “Holes” written by Louis Sachar is a fascinating story that has won many medals such as the John Newberry Medal, for the most distinguished contribution to American literature for children. I am reviewing someone else’s book review on this book. I agree with what Ivan said, how some confusing parts of the story were explained things through the flashbacks. This is one thing about the book that makes it unique. An example of this is when Stanley Yelnats (protagonist) finds a lipstick case that has KB on the back of it. Stanley and the others give it to the warden. The Warden becomes excited because Kate Barlow was a robber who stole lots of money and jewelry and when they found the lipstick case she believed that they were very close to the treasure. The only reason why I found out that KB is Kate Barlow and who exactly Kate Barlow is because of the flashbacks. There were many flashbacks, which pretty much unfolded the mysteriousness of the story, and at the end they helped the story to make sense. I disagree though Ivan when you said that the names of the characters made the story more interesting, because yes some of the names and nicknames were cool like Stanley Yelnats (if you spell it backwards it still is Stanley Yelnats) but many were really childish like Armpit or Xray. I also believe that if they had different names I would still have liked the book just as much. The names of the characters in the story didn’t really matter to me. The story and the things about the characters are way more important. There was nothing really else he talked about other than he would recommend the book “Holes” to people who like: adventure, pieces of stories fitting together and stories that have humor. I agree and disagree with him because the humor was more for younger children, however it was an adventurous story. 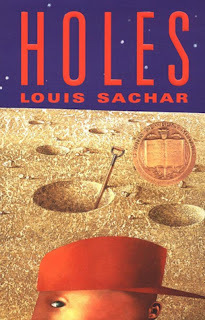 I thought “Holes” was an unique book that had lots of twists and it put you in the shoes of the protagonist, Stanley Yelnats. One thing that I really enjoyed about this story is that many characters other than the protagonist were involved in the development of the plot/story like Zero and the Warden. For example when Zero ran away, Stanley wanted to run away also, so he did run away. I also liked how there was more than one character that developed throughout the story because in most stories just the protagonist develops. I believe a theme you could interpret from this story is perseverance and always think of the best. The reason why I think that you could interpret this theme from the story is because Stanley always tried to think of the best and always kept trying even though it was tough and seemed impossible to keep going. Stanley wasn’t the only one who had perseverance his dad also kept trying to create a new project for shoes. After lots of trial and error at the end of the story he had created a great new product for shoes. I think the reason why Louis Sachar incorporated the theme of perseverance into the story is because she wants kids to learn at a young age to keep trying and not give up in life. Even though Louis Sachar wrote the book for kids I believe that the deeper message in the book is for every one of all ages. Overall I really loved the book and would recommend it for kids from the ages of 10-12, who like stories that have a lot of adventure because the humor is more childish and because the story has a great plot and setting with a fantastic adventure. Your book review (on another book review) is terrific. I like how you explored the literary elements deeply and included things like protagonist and theme. I like how you also included some extras such as the age recommendation you would give on this book. I do also agree with you of how some characters were "Childish". Your blog is aesthetically pleasing as the background of your blog are books and relate to your content inside your blog. Also your title is neat! I have also read this book and didn't really seem to find an antagonist and when I read over your review I don't see you have mentioned it too. Do you think there is an antagonist in this book?... Because I couldn't find one! Great review on a review. From your report I feel like i've read it. You gave lots of great description and detail as to what happened. One things about your review that separates it from others is that not only did you talk about a lot of the literary elements but you gave good detailed examples. You talk a lot about the main character Stanley and how he is the protagonist in the book but you don't talk about any other characters. I would like to know what other characters there were and what roles they played. Overall great review! Good Job, Aidan!!!!! Keep up the good work!! !